Step 0: Download and install stack. Step 1: Drag the stack onto the page . After dragging the stack onto the page, select the amount of columns that you want displayed. 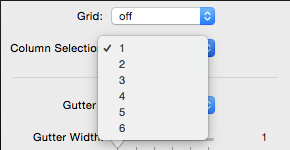 The selector for that can be found in the stack options under (Column Selection). Step 2: Input the content that you want into the stack. The grid is an option that will reduce the amount of times that you have to drag Responsive Grids onto a page. Gutter: The gutter has to option to turn off and on. Gutter Width: Select the width of the gutter if you have the Gutter option turned on. Bottom Margin: Input how much spacing you want bellow Responsive Grids. Split: Split is an option unique to the 2 columns option. Choose whether you want the stack to be a 50/50, 40/60, etc. The Spacing option is the option for the padding on the top and bottom of the single column stack. This become very helpful if you are doing a single page website or even a portfolio site. Step 1: Turn on spacing. Step 2: Select whether you want to use pixels or percentage. Step 1: Turn on the Max-Width option to activate it. Step 2: Input how large you want your stack to be. You have a choice to have images be responsive. Step 1: Activate responsive images. Step 2: Input how wide you want your image to be.